SRMS IBS offers a Post-Graduate Diploma in Management (PGDM), a two- year, full-time residential course. The course is duly approved by the All India Council for Technical Education (AICTE), New Delhi. The core focus of the course is the development of global leaders with strong technical business knowledge and to foster innovation. Team based learning forms the core of the teaching methodology of the course. Specializations: Banking, Marketing, Finance, International Business, H.R Management & Information Technology. SRMS IBS has a conducive learning environment with a course curriculum that’s a blend of theoretical and practical knowledge which is not only contemporary in approach but also relevant to the industry. The core courses taught in the first four terms cover the basics of Marketing, Finance, Strategy, Operations, Human Resources and General Management. We offer a specialization in Banking, Marketing, Finance, International Business, Human Resource Management, Information and Technology. Besides being up-to-date about the latest management trends and practices, you will have a new holistic learning experience. The course courses provide you an understanding of the fundamentals of general management, while the selective courses give you the flexibility of individual exploration in your chosen areas of interest. The two-year program starts with the pre-term and the orientation courses followed by the six trimesters of 3 months each. 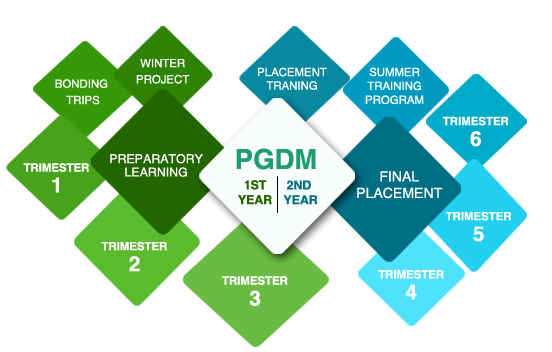 The first three trimesters cover the introductory, analytics and course courses, laying the foundation for the advanced elective courses in the later terms. To special in one are, a student has to take a minimum of six electives from that areas. Students also have to choose 3 additional electives.